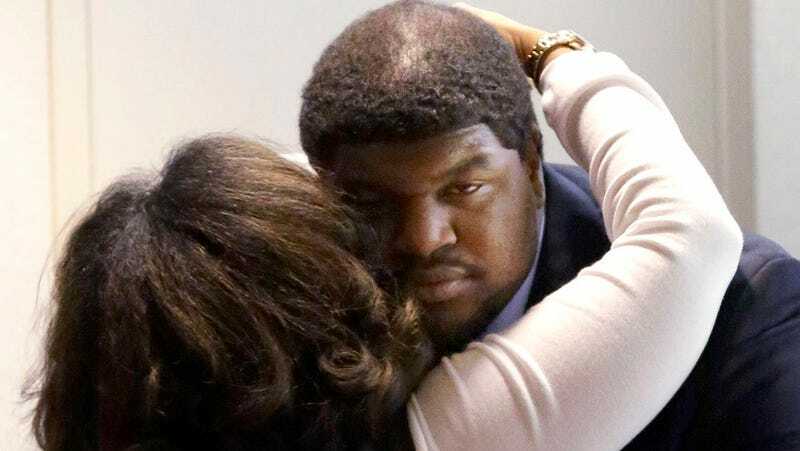 A jury found Josh Brent guilty today of intoxication manslaughter for the 2012 high-speed accident that killed his teammate Jerry Brown. Prosecutors argued that the 320-pound Brent was .18 BAL drunk (on as many as 17 drinks) and speeding home from a night club, going 110 mph in a 45, when he flipped his Mercedes on a service road. Police dash-cam footage shown at trial depicted a stumbling, slurry Brent flunking his sobriety test. Brent and Brown were best friends and one-time roommates at the University of Illinois. Brown's mom invited Brent to her son's memorial service, telling CBS Sports last year, "I knew Josh was hurting just as much as I was because Jerry was his brother. If being mad at Josh would bring Jerry back, then I'll be mad at Josh, because I want my son, but then what do you give to the rest of your family if you're bitter. So, I had no problem with him coming to be at the memorial service with us, I had to forgive him." Brent is 25 and could face 20 years in prison.